Persuasion towards healthier eating decisions is a challenging field of research, depending on various internal and external factors. Recent advances in sensor-enriched mobile devices and wearables enable persuasive techniques to predict and influence people’s food decisions. 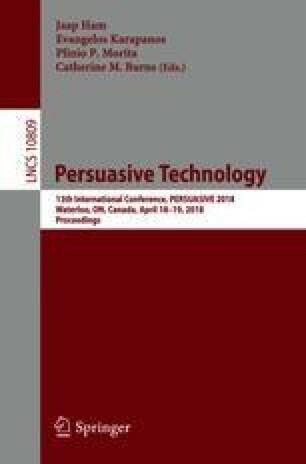 One such technique, just-in-time adaptive interventions (JITAIs), provide users with personalized and situation-related content and thus, exploit windows of high user receptiveness for persuasion. This work’s aim is to shed light on context characteristics of such windows by analyzing 469 meal decisions as well as relating in-depth interviews on eating behaviour. We derive and describe four interesting windows in which JITAI’s could be effective: (1) Lack of Alternatives, (2) Unawareness of Alternatives, (3) Evening Cravings, and (4) Social Pressure. On the basis of these situations, we postulate recommendations for timing and content of JITAIs for healthy eating. We plan to use the findings to implement and evaluate ubiquitous nutrition-supportive interventions in the future.